Stella Arnaldo's Blogspot: Travel Bites: Long live the 'Queen'! Its infrastructure is comparable, if not superior, to most cities in the country. It offers travelers modern conveniences just like any of the other most cosmopolitan cities in the world, amid a relaxed, holiday vibe. The city has a wide array of entertainment choices for travelers—from island-hopping to lounging in beaches, taking a swing in its many golf clubs, historical and cultural sights from the Spanish colonial era, looking for elusive birds unique only to the local ecology. Or how about dancing your cares away at the latest night spot? Heritage tour. 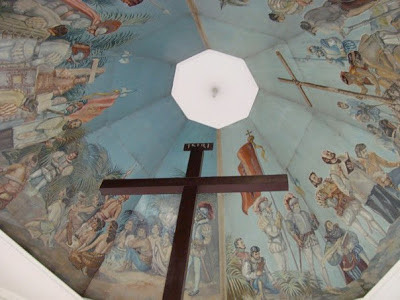 The Shrine of Magellan’s Cross (Magallanes Street, downtown Cebu City) is said to be the cross planted by Portugese explorer Ferdinand Magellan’s men upon his arrival in Cebu in 1521. Built in 1566, the baroque-inspired Basilica Minore del Sto. Niño (Osmeña Boulevard) is the oldest Catholic Church in Cebu and established on the site where a statue of the Sto. Niño (the Child Jesus) was supposedly found intact in a charred box purportedly left behind by Magellan and his crew. A museum houses antique religious artifacts depicting the history of Christianity in Cebu. 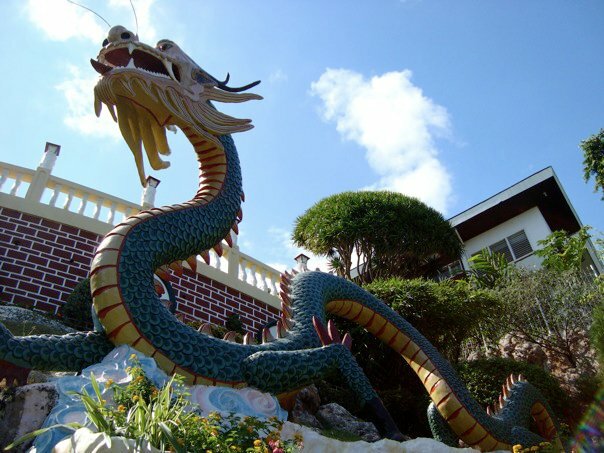 A fierce dragon guards the entrance to the Taoist Temple, a center of faith for Chinese-Filipinos in Cebu. The 40-year-old Taoist Temple located in Beverly Hills—an enclave for well-heeled Cebuanos—is the center of religious life of Cebu’s Filipino-Chinese community. Its amazing architecture features images and sculptures of fierce dragons. Visitors have an amazing view of the city, especially from its third-level praying room, where they can also make petitions to ancient Chinese spirits and gods. You can rent a car with a driver to take you around Metro Cebu’s famous tourist spots, or just grab a map of the city and take metered taxis to get there. For a more professional guided tour, call Bino Guerrero (CP# +63932-8151975/+63916-7904611), who specializes in heritage tours and walking tours. Birdwatching. While island-hopping from adjacent Mactan City, take a trip to Olango Wildlife Sanctuary, a haven of some 40,000 migratory birds. Islands Banca Cruises offers trips to Olango as well as other island adventures. Culinary trip. 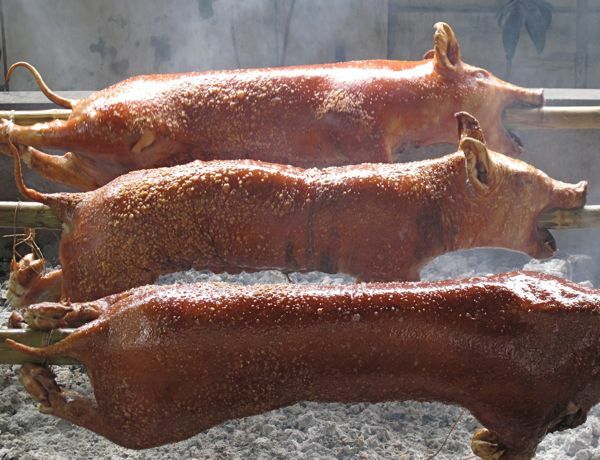 Tourists will always have a satisfying meal at the Original AA BBQ (M.J. Cuenco Avenue and Legaspi Extension, Barangay San Roque) with its friendly price points and fresh seafood on the grill. Café Laguna at the Terraces, Ayala Center (T# 032-2310922) is the place to go for simple, authentic Filipino fare. Choice dishes are the lato salad (seaweed salad), crispy pata (crispy pork hock and knuckle) and ginataang kalabasa (squash cooked in coconut milk). The “best pig in the world,” according to chef and TV host Anthony Bourdain, comes from Zubuchon (Escario Central, Escario Street). Its crispy-bubbly skin and herb-infused, tender pork meat make it stand out from the rest of the ubiquitous Cebu lechon. Nighttime thrills. House beats from resident and international DJs keep the patrons dancing at The Loft (2F/ CJRS Point, Asiatown IT Park). Tavolata (AS Fortuna at P. Remedio Street) has a perfect chilled-out ambiance for those after-dinner conversations over drinks. Foreign bands and artists drop by Cebu in their whistle-stop international tours: America with Kalapana plays at the Waterfront Hotel on October 19, while the Jonas Brothers performs at the same venue, the following day. Where to stay: The colorful and preppy Islands Stay Hotel (Archbishop Reyes Avenue, Cebu City (T# 032-2660832) appeals to the budget-conscious but finicky traveler. For luxurious, pampered vacations, the Shangri-La Mactan Resort and Spa (Punta Engaño Road, Lapu-Lapu (032-2310288) is the only choice. It has a marine sanctuary where guests can feed the fish, as well as CHI Spa, for the most pleasurable and relaxing massage treatments. Getting there: All Philippine carriers have daily flights to Cebu from Manila, Clark and Davao.